Filicudi (Italian pronunciation: [filiˈkuːdi]) is one of eight islands that make up the Aeolian archipelago, situated 30–50 km (19–31 mi) northeast of the island of Sicily, southern Italy. It is a frazione of the comune of Lipari. Its total area is 9.5 km2 (3.7 sq mi). There are several small villages on the island, which include Pecorini Mare and Valdichiesa. Filicudi's lands are capable of producing wine, olive oil, grain, and vegetables. 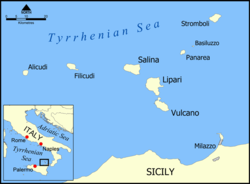 In 1997, three quarters, approximately 7 km2 (2.7 sq mi) of Filicudi was turned into a Natural Reserve. The highest point is Monte Fossa Felci at 774 m (2,539 ft). Other points include Monte Montagnola at 349 m (1,145 ft) and Monte Terrione at 278 m (912 ft). At Capo Graziano are the remains of a Bronze Age village dating back to the second millennium BCE. Off the coast, the volcanic finger-like rock of La Canna rises about 74 metres (243 ft) above the sea. The modern name of "Filicudi" is a corruption of the ancient Greek name for the island, Phoenicusa (Phoenician island). The island, like the other Aeolian Islands, was settled since the Neolithic Age, around 3000 BCE. As evidenced by archaeological findings, the island was occupied by a new people during the Bronze Age. The island was uninhabited for many centuries until occupied by the Greeks. Roman and Byzantine remains can also be found on the island. Since the 1970s Filicudi was rediscovered and populated by photographers and artists such as Sergio Libiszewsky, Ettore Sottsass, novelist Roland Zoss, and editor Giulio Einaudi. Their perceptions brought the island into the focus of modern tourism. ^ "14th General Population Census and General Housing Census (2001)". DaWinci. This page was last edited on 19 November 2018, at 19:13 (UTC).